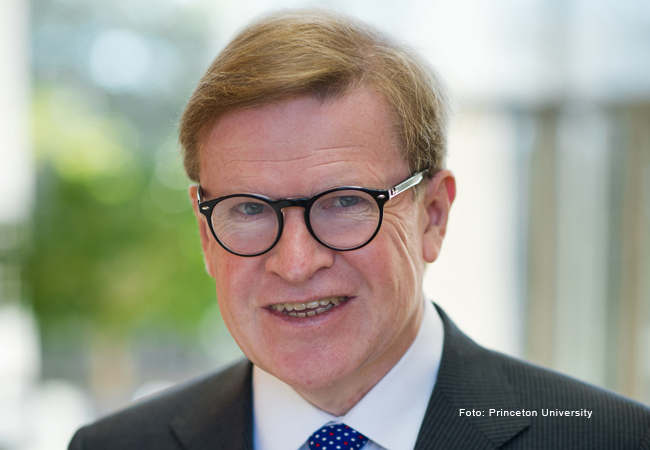 Harold James, Princeton University, will hold the Visiting Professorship of Financial History at Goethe University Frankfurt’s House of Finance this year. The professorship is endowed by Metzler Bank and Friedrich Flick Förderungsstiftung. Harold James is Claude and Lore Kelly Professor in European Studies, Professor of History and International Affairs, and Director of the Program in Contemporary European Politics and Society at Princeton University. Furthermore Professor Harold James holds the position of Official Historian at the International Monetary Fund. His research focuses on Economics and Financial History and Modern European History. James was educated at Cambridge University (Ph.D. in 1982) and a Fellow of Peterhouse for eight years before joining Princeton University in 1986. In 2004 he was awarded the Helmut Schmidt Prize for Economic History, and in 2005 the Ludwig Erhard Prize for writing about economics. James’ publications include a study of the interwar depression in Germany (“The German Slump”, 1986), an analysis of the changing character of national identity in Germany (“A German Identity 1770-1990” 1989), and a study on “International Monetary Cooperation Since Bretton Woods” (1996). He was a co-author of a history of Deutsche Bank (1995) which won the Financial Times Global Business Book Award in 1996, and he wrote the book “The Deutsche Bank and the Nazi Economic War Against the Jews” (2001). Furthermore he published “The End of Globalization: Lessons from the Great Depression” (2001); “Europe Reborn: A History 1914-2000” (2003); “The Roman Predicament: How the Rules of International Order Create the Politics of Empire” (2006), and “Family Capitalism: Wendels, Haniels and Falcks”. His most recent works are “The Globalization Cycle” (2009); “Making the European Monetary Union” (2012), and “The Euro and the Battle of Economic Ideas (with Markus K. Brunnermeier and Jean-Pierre Landau)” (2016). During his stay in Frankfurt, Harold James will deliver a CFS Presidential Lecture on 28 May. Also, he will give a seminar in the Ph.D. program of the University’s Graduate School GSEFM at the House of Finance on the topic “Thinking About Financial History”. On 8 June 2018, James will give the keynote address in an international research conference on “Lehman – 10 Years After” which he co-organizes together with Bernd Rudolph, LMU. Professor James is the fourth holder of the Visiting Professorship of Financial History. In the context of this professorship, distinguished international experts in banking and financial history are invited to share their research insights and methods with researchers, students and the interested public in Frankfurt. Cooperation partners are the Research Center SAFE at the House of Finance and the Institut für Bank- und Finanzgeschichte. Previous Visiting Professors were Benjamin Friedman, Harvard University (2015), Caroline Fohlin, Emory University, Atlanta (2016) and Hans-Joachim Voth, University of Zurich (2017). The Visiting Professorship was initially endowed by Metzler Bank and Edmond de Rothschild Group in 2014 on the occasion of Goethe University’s centennial.